Jane Austen’s novels criticizing sentimentalism, the British landed gentry, and women’s dependence on marriage have remained in print continuously since 1832, when the publisher Richard Bentley purchased the copyrights of all six of Austen’s works. For the past 186 years those stories have thrilled readers around the globe. Now comes a picture-book biography for children attempting to piece together Austen’s rise to fame. Brave Jane Austen: Reader, Writer, Author, Rebel (Holt, $17.99, 48 pages) explores Austen’s modest upbringing and how she quietly forged a career as an author at a time when most women aspired to fortuitous marriages to secure their economic status. 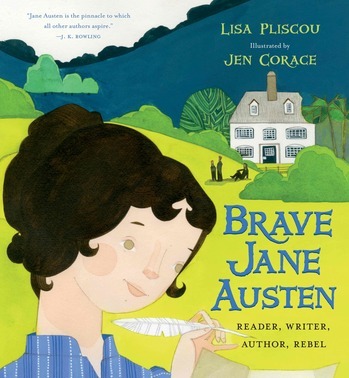 Though little is actually known about Austen’s childhood since she kept no journal or diary, author Lisa Plisco admirably examines just how Austen developed her plucky wit and delightfully biting sense of irony. (Spoiler: Austen read a lot of books.) Illustrator Jen Corace’s vibrant mixed-media illustrations show a rosy-cheeked Austen, likely an homage to the portrait of Austen completed in 1810 by her sister, Cassandra. Have a future wordsmith on your hands? Give her this beguiling introduction to a great woman of letters. Jane Austen's novels criticizing sentimentalism, the British landed gentry, and women's dependence on marriage have remained in print continuously since 1832, when the publisher Richard Bentley purchased the copyrights of all six of Austen's works. For the past 186 years those stories have thrilled readers around the globe. Now comes a picture-book biography for children attempting to piece together Austen's rise to fame. Brave Jane Austen: Reader, Writer, Author, Rebel (Holt, $17.99, 48 pages) explores Austen's modest upbringing and how she quietly forged a career as an author at a time when most women aspired to fortuitous marriages to secure their economic status. Though little is actually known about Austen's childhood since she kept no journal or diary, author Lisa Plisco admirably examines just how Austen developed her plucky wit and delightfully biting sense of irony. (Spoiler: Austen read a lot of books.) Illustrator Jen Corace's vibrant mixed-media illustrations show a rosy-cheeked Austen, likely an homage to the portrait of Austen completed in 1810 by her sister, Cassandra.